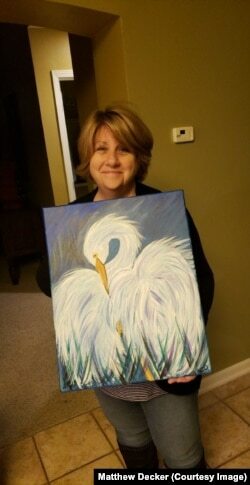 Cyndi Decker with a painting of a huge white bird called an egret. The Internet can be a dark, oppressive place. Readers sometimes do not show their true identities and feel free to leave cruel comments. 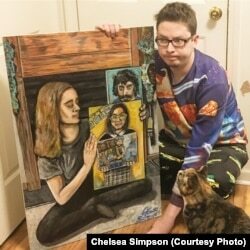 So naturally, a schoolteacher in the U.S. state of Florida felt worried when her son wanted to share her artwork on the social media site Reddit. Cyndi Decker had recently taken an art class and made a painting of a huge white bird called an egret. Far from not liking it -- more than 24,000 people “upvoted” her painting, meaning they liked it! 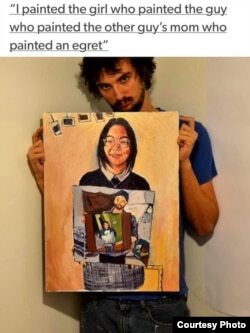 Then a professional artist in Sweden saw the photo on Reddit. Kristoffer Zetterstrand creates, among other things, paintings for the video game Minecraft. He decided to pay tribute to the mother-schoolteacher by painting Decker holding her painting. He even captured the shy look on her face. 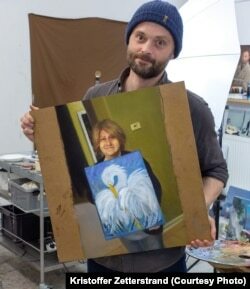 Kristoffer Zetterstrand, an artist in Sweden, paints a picture of a mom holding a picture that she painted. It started a worldwide painting meme. 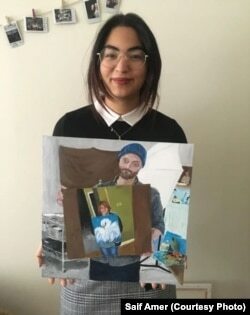 Then, two days later a journalism student in Canada, Laila Amer, painted a picture of Zetterstrand holding his painting of Decker holding her painting. Laila Amer holds her painting. Well, then the Internet stepped in and took over as only the Internet can. Artist Travis Simpson continued the fun. Travis Simpson also paints a picture for the "mom paints and egret" meme. And it happened again and again and again! In the very later paintings, the image of the original inspiration, Decker’s egret, is so small you can barely see it! Many artists around the world jumped into the process, many at the same time. It began to get confusing. People started calling the egret a swan. 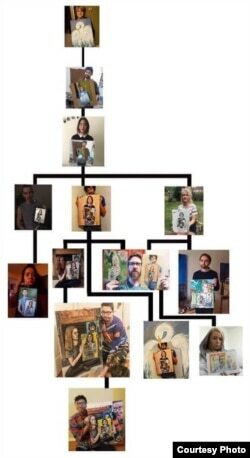 So, someone stepped in and created a flowchart to show how the paintings developed. A much-needed flowchart to keep track of the "Mom painted a picture of an egret" meme. The painting styles were all quite different. They began showing up not just on Reddit but on other social media platforms such as Facebook. Kristoffer Zetterstrand, who first painted Decker, told reporters that he has received thousands of comments on Reddit and hundreds of messages and emails. He says millions of people have now seen his painting on a number of social media websites. In interviews, he said he thought the whole experience has been really funny and strange. Zetterstrand and Decker have been in touch with one another. 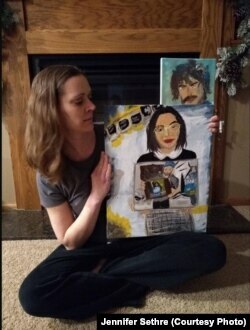 He sent her his painting of her holding her painting as a gift. Instead of the cruel comments she was expecting, Decker said so many people have been very kind to her. She joined Reddit just so she could thank them. She is happy to be famous just once. To use another English expression, it’s better to leave at the height of the party. Anna Matteo adapted this from several online stories including Roisin McVeigh’s story published on DazedDigital.com and Allison Klein’s story in the Washington Post. Kelly Jean Kelly was the editor. wear out her welcome – phrase To remain a guest in a place, especially someone's home, for too long, to the point where the host no longer wishes one to stay. It’s better to leave at the height of the party – phrase This means it is better to leave when things are going really well before things start turning bad.